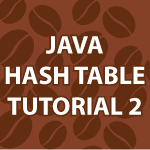 Welcome to the 2nd part of my Java Hash Tables tutorial. If you missed part 1, definitely watch it first here Java Hash Table. This video provides many useful algorithms aside from the info on hash tables. * System.out.println("Modulus Index= " + arrayIndex + " for value "
System.out.println(key + " was found in index "
Is possible another way of dealing with collisions is to make a 2D array ([x][y]) and instead of moving a value with a index up the array by [i++] you move the value using the same index [x] but inputting into an empty portion of the array in the [y] portion of the 2D array? Was this just an overlooked mistake or should I be understanding something that I don’t seem to be?